All the best Greek restaurants in NYC, all in one place. You might be asking yourself, what is Souvlaki GR, a seemingly unremarkable Lower East Side restaurant and food truck doing with a review on The Infatuation? Good question. We'd never considered eating here until we needed some late night grub after a show at Bowery Ballroom. But after wandering around for about twenty minutes at 10:30pm on a Tuesday and realizing that we'd never be able to wash the shame of San Loco off our souls, we wandered in to get our Greek on instead. And we've gotta say, these little souvlaki wraps are six bucks well spent. Apparently souvlaki is a common street food item in Greece. It's basically a charcoal grilled meat, wrapped in a pita, with french fries stuffed inside. Yes, it's random. And yes, it's delicious. We took down a few different varieties, and went in on some of the other menu items after that. 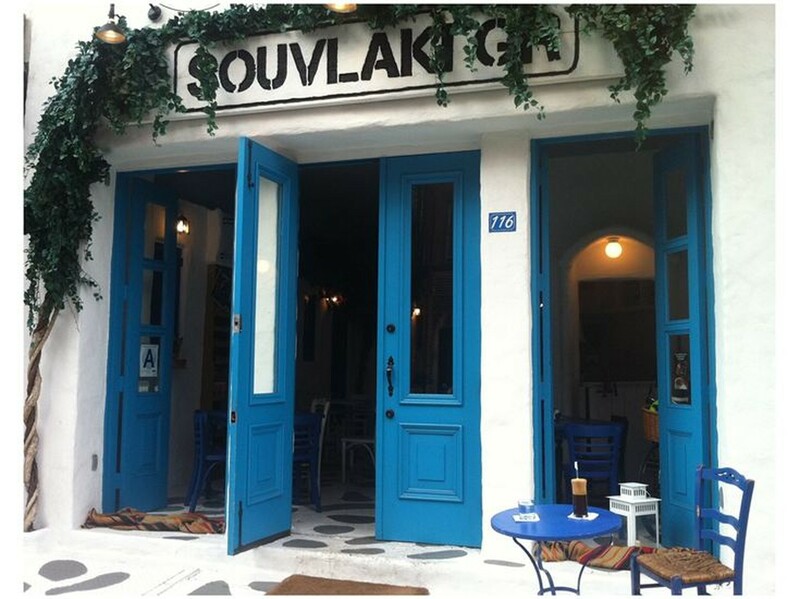 At the end of the day, we came away glad that we gave Souvlaki GR a chance. Is it going to change your life? Not even close. But it might save it in a pinch, when your only choice is this or the burrito place across the street that people throw up in from time to time. Remind us again why we hang out in this part of town? A very good, very authentic bowl of hummus. We'd come here just to eat some of this with one of their Greek beers in hand. This big, ugly looking pile of fries has been smothered with more feta cheese than you've ever seen at one time in your life. It's a huge mess, but it's also pretty damned tasty, and also very good with a beer. A simple Greek salad that will get the job done, as long as you go in knowing that it's a very simple Greek salad. Just tomato, cucumber, onions, and olives. The house specialty. All you have to do is choose your meat: chicken, pork, or bifteki - a beef meatball that's been grilled with feta inside it. We like the pork and the bifteki the best. For those of you who are watching your carbs, this is your option. These are the souvlaki meats on skewers, served with some tzatziki. Go get 'em.